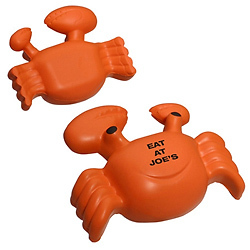 Shed your old shell and create a new campaign using a crab stress reliever for announcing new ideas. Our Stress Relievers are all made by hand; no two balls are exactly the same. It is impossible to guarantee a consistent, uniform imprint. 4" x 3-1/2" x 1-1/2"
Bulk / 24 lbs / 250 pcs. / 24" x 14" x 15"box. Imprint Area: 1.375" x 1.125"
Imprint Area: 1.25" x 0.75"